NASA has announced plans to issue a potential five-year contract for the continued use of a Bigelow Aerospace-built expandable activity module currently attached to the International Space Station. 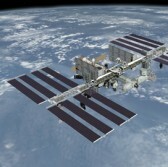 The space agency said Tuesday it seeks to utilize the Bigelow Expandable Activity Module as an expandable habitat and long-term in-orbit storage unit as part of efforts to maximize technological capacities onboard the ISS. Bigelow Aerospace will also have opportunities to use the BEAM habitat as a platform to test new space technologies in low-Earth orbit through an extended partnership with NASA. ISS crew has used BEAM to perform radiation shielding experiments, install passive radiation badges and gather microbial air and surface samples since the module arrived to the station last year. NASA added its partnership with Bigelow Aerospace will support the space agency’s efforts to create deep space habitation systems for potential future manned missions to destinations beyond Earth orbit.